It's amazing how quickly a company can rise and fall from grace in the computer industry. VIA were once known for building inexpensive low end chipsets which were targeted towards the budget market. When Intel released the 133 MHz based Pentium 3 processors without a mainstream chipset, VIA saw an opportunity and took advantage of it. The rest is history. VIA are also the only third party chipset manufacturer to rise to AMD's challenge and capture dominance riding the highly successful Athlon processor. Even though VIA went through countless revisions of chipsets (KT133 -> KT133A, KT266 -> KT266A) consumers had no real alternative as there was nothing on the market that was better. In the summer of 2002, nVIDIA launched the nForce2, and usurped VIA's position as AMD market leader and for the first time in a long time VIA had to play catchup. Playing catchup is something VIA is not very good at. 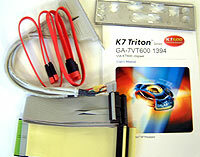 Neither the KT400, or KT400A was a match for the competition put up by nVidia. VIA regrouped and released the KT600 chipset to counter to the eleven month old nForce2. Would VIA be able to regain the top spot in the AMD world? 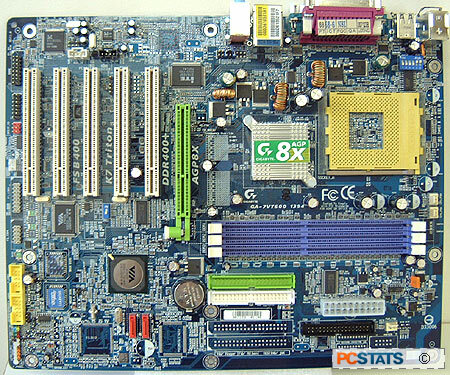 We'll find out today as we test the Gigabyte GA-7VT600 1394 motherboard, which obviously, uses the VIA KT600 Northbridge. The Gigabyte GA-7VT600 has a retail price of just $143 CDN ($102 US) and comes with on board 5.1 audio, Serial ATA/Serial ATA RAID, 10/100 LAN, IEEE 1394 and of course dual BIOS's. The GA-7VT600 can use any 200/266/333/400 MHz based Athlon processor and will handle up to a maximum of 3GB of PC1600/2100/2700/3200 DDR RAM. The Gigabyte GA-7VT600 1394 is a pretty big motherboard so you'd better have a roomy case. The general layout of the board is excellent, the main IDE/floppy drive and ATX power connectors are in their most ideal location to the right of the DIMM slots. All the headers are place at the bottom of the motherboard which makes attaching the headers much easier as all the cables will be out of the way. Pg 9. A match for nForce2?